Cross-reacts with Cynomolgus/Rhesus IFN-α. No cross-reactivity against human IFN-β, IFN-γ, or IFN-ω; mouse or rat IFN-α, IFN-β or IFN-γ; or bovine IFN-τ. This high sensitivity Human IFN Alpha ELISA kit is designed to provide accurate low pg/ml measurement of ALL human interferon alpha subtypes in autoimmune sera, normal serum, and tissue culture media (TCM). This unique feature provides an improved view of global IFN-alpha production in sample analysis. Interferons (IFNs) are a family of mammalian cytokines initially characterized by their ability to inhibit viral infection. They are synthesized and secreted by most cell types in response to pathogens. In addition to their antiviral properties, IFNs have also been shown to exhibit anti-proliferative, immunomodulatory and many other activities. In humans, IFN-α consists of a group of proteins that are greater than 85% homologous by amino acid sequence. Numerous individual human IFN-α subtypes have been identified; many display different properties. 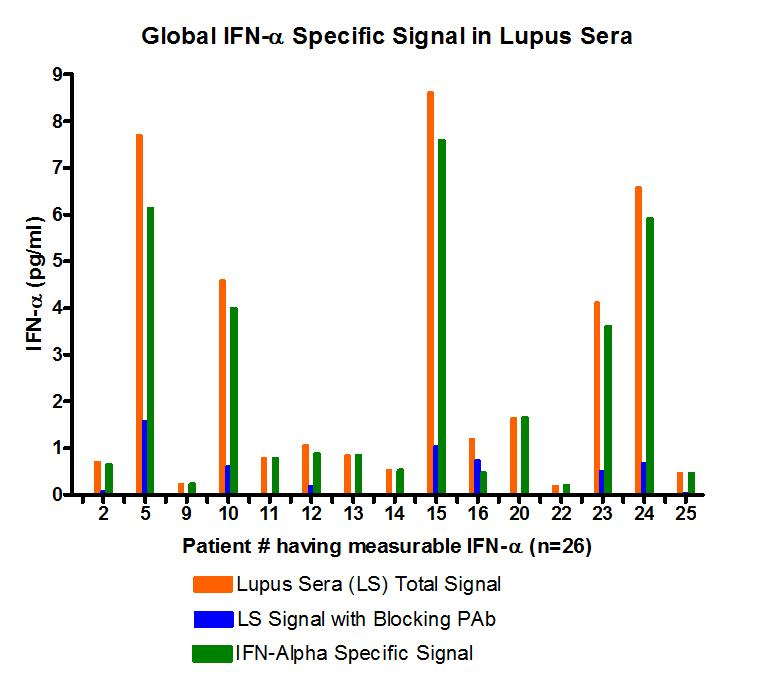 It remains unclear why there are multiple IFN-α subtypes. A variety of studies suggested they possess overlapping but also unique sets of biological activities. Staehelin et al. (1981) "A Rapid Quantitative Assay of High Sensitivity for Human Leukocyte Interferon with Monoclonal Antibodies" in Methods in Enzymology, Vol. 79 (Pestka, ed. ), Academic Press, New York, 589-595. Kelder et al. (1986) "A Sandwich Radioimmunoassay for Human IFNa" in Methods in Enzymology, Vol. 119 (Pestka, ed. ), Academic Press, New York, 582-587. Human IFN-α international reference standard provided by the NIH, reference no. Gxa01-901-535. Pestka (1986) "Interferon Standards and General Abbreviations" in Methods in Enzymology, Vol. 119 (Pestka, ed. ), Academic Press, New York, 14-23. Rubinstein et al. (1981) "Human Leukocyte Interferon: Isolation and Characterization of Several Molecular Forms," Arch. Biochem. Biophys. 210, 307-318. Hobbs et al. (1982) "Purification and Characterization of Interferons from a Continuous Myeloblastic Cell Line," J. Biol. Chem. 257, 4071-4076.